A gentle and rejuvenating cleansing treatment formulated with rejuvenating Rosa Mosqueta oil, soothing Calendula extract, smoothing Cocoa Butter and purifying Rosewater. This gentle cream will cleanse without stripping the skin’s vital oils, purify, tone and rejuvenate the complexion and gently remove make up (even eye make up). Use daily to remove impurities and make up, leaving the skin feeling refreshed, toned and supple. 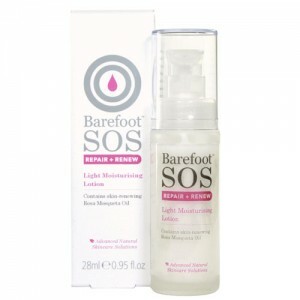 Barefoot SOS Repair + Renew products are rich in Rosa Mosqueta (rosehip oil), known as nature's miracle oil. Rosehip seed oil is a natural source of essential fatty acid and antioxidants to promote healthy skin cells for improved skin tone and vitality. AQUA (WATER), GLYCERIN, CETEARYL ALCOHOL, GLYCERYL STEARATE, CAPRYLIC/CAPRIC TRIGLYCERIDE, CAPRYLYL GLYCOL, GLYCERYL STEARATE CITRATE, ROSA CANINA (ROSEHIP) FRUIT OIL, THEOBROMA CACAO (COCOA) SEED BUTTER, PRUNUS AMYGDALUS DULCIS (SWEET ALMOND) OIL, HELIANTHUS ANNUUS (SUNFLOWER) SEED OIL, SODIUM STEAROYL GLUTAMATE, VITIS VINIFERA (GRAPE) SEED OIL, ETHYLHEXYLGLYCERIN, XANTHAN GUM, ROSA DAMASCENA FLOWER WATER, CITRUS NOBILIS (MANDARIN ORANGE) PEEL OIL, GLYCERYL OLEATE, LIMONENE*, TOCOPHEROL, ALCOHOL, CALENDULA OFFICINALIS FLOWER EXTRACT, FUSANUS SPICATUS (SANDALWOOD) OIL, LAVANDULA ANGUSTIFOLIA (LAVENDER) OIL, BOSWELLIA CARTERII (FRANKINCENSE) OIL, ROSA DAMASCENA FLOWER OIL, MALVA SYLVESTRIS (MALLOW) FLOWER EXTRACT, ASCORBYL PALMITATE, LINALOOL*, PELARGONIUM GRAVEOLENS (GERANIUM) FLOWER OIL, CITRIC ACID. * NATURALLY OCCURRING AROMATIC COMPONENTS FROM ESSENTIAL OILS. Apply morning and evening with cotton pads or a muslin cloth dampened in warm water, working on both sides of the face together to gently remove make-up and impurities. For external use only. It is important to patch test if you think you may be sensitive to any ingredients used. Contains nut oil. Avoid contact with eyes. Store in a cool place away from sunlight. No Parabens, No Mineral / Petroleum Based Oils, No Synthetic Colour or Fragrance.